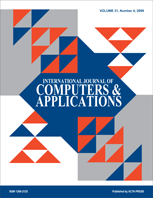 Formerly known as the International Journal of Mini and Microcomputers, this journal has now also been merged with the journal Microcomputer Applications. All aspects of contemporary computers and their applications are covered including technology, hardware and software systems, networking and communications, multimedia systems, and the Internet as well as microcomputer applications such as engineering, science, business, management, robotics, manufacturing, and personal computers. It appears quarterly.